Comedy can engage people on social justice issues where facts or advocacy fall short, according to researchers, and funders should consider backing this nascent field. 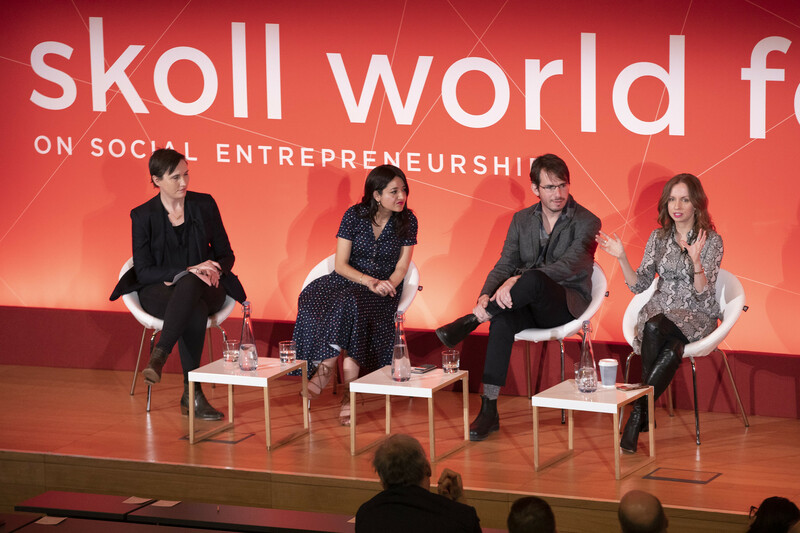 Caty Borum Chattoo, director of the Washington DC-based Center for Media & Social Impact, told an audience at the Skoll World Forum yesterday that people play closer attention to serious, complex information when delivered through comedy. It can also be a source of hope and optimism on issues usually portrayed as hopeless – emotions that help to motivate behaviour change. But, she emphasised, comedy as a tool for persuasion only works if there’s genuine entertainment value. If it’s too ‘message-y’, it won’t work; social justice leaders need to allow comedians “real creative freedom” to be entertaining for it to be effective. Pictured above: moderator Fenella Kernebone, Erika Soto Lamb, comedian Omri Marcus and Caty Borum Chattoo. Erika Soto Lamb, from TV network Comedy Central and also a panellist at the Skoll World Forum session, said comedy is “perfect” for today’s short attention spans: it can reach those who may lack the appetite for documentary or feature films tackling the same issue. Soto Lamb joined Comedy Central last autumn as vice president for social impact strategy – the first time the company has employed someone in this role. She said there are no plans to turn the channel “into a social justice network”, but highlighted how the right content can drive home the absurdity of situations, as in comedian Amy Schumer’s sketch about access to birth control. But rather than rely only on individual efforts like these, Comedy Central is now supporting more strategic collaboration – as one of the partners behind Yes, And Laughter Lab, an unusual new initiative that will support five original comedy projects “that marry quality (great, entertaining comedy) and social impact”. In this first round, it received around 500 applications – hundreds more than expected, said Borum Chattoo, whose organisation is also driving the initiative. The Lab is currently US-based, but organisers hope to take it abroad, with Mexico and India interested so far. Getting past pilot stage will require funding, and Borum Chattoo is hoping new backers will come on board both for this initiative and for comedy more broadly. She said it was “not easy to raise the money” for the Lab, but this was unsurprising for a first-time idea – and one that may at first seem “a little weird”. A key piece of work in coming years, she added, would be to educate funders on this topic. Some influential organisations are already on board: Pop Culture Collab, which funds the Lab, includes among its members the Ford Foundation and Open Society Foundations. What was the panel’s advice for those wanting to better connect the two sectors? From the perspective of comedy writers, Soto Lamb said it was not their job to understand issues deeply; she is keen to “develop really strong partnerships” with organisations who can brief them. Similarly, social sector organisations should work with the professionals, rather than assume they can deploy a colleague to write material. Ending up with “mansplaining and bad Dad jokes”, the panel agreed, is unlikely to create social change.